Our garden lies in what Sunset calls “one of Northern California’s finest horticultural climates.” We are located in an area of wet mild winters and dry mild summers — a Mediterranean climate zone. It’s a region with unique challenges and opportunities. I love gardening here. Approaches to gardening are strongly determined by scale. Our garden is a small family garden. Its core was formerly a swimming pool. 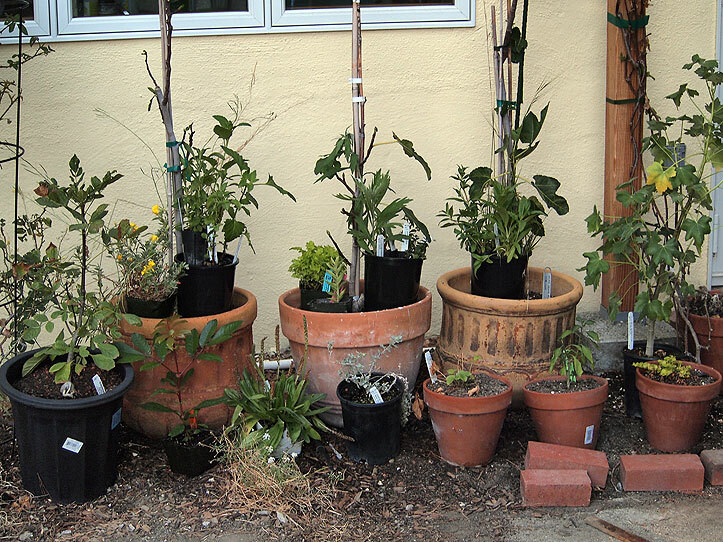 Often we might be growing just a single plant in a container, or a handful of plants, where a larger-scale gardening operation might be planting long rows of crops. Over time we have adjusted to find the right balance for our home garden. And you can contact me here. Some rights reserved 2019 Tom’s Garden. This work is licensed under a Creative Commons (attribution, noncommercial, no derivs: 3.0) License (US), although some of the work this blog incorporates may be separately licensed. Text and images by Thomas Christensen unless otherwise noted. For print permissions or other inquiries please request via rightreading.com/contact.htm.